Courtesy of Real Estate eBroker, Tiffany Marson. Beautiful turn-key home in San Elijo Hills surrounded by great schools, parks, trails, shopping and dining all within walking distance! This home is located on a quiet, flat street close to cul-de-sac. With fresh exterior and interior paint and new carpet it feels and looks brand new! Offering an open floor plan full of upgrades, a gourmet, entertainer's kitchen, downstairs bedroom with en-suite bathroom, bonus room perfect for an office or play room and backyard with fireplace & built in BBQ! A must see! 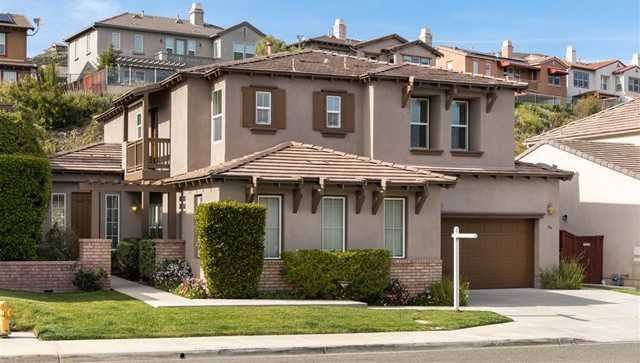 Please, send me more information on this property: MLS# 190018847 – $869,000 – 736 Hollowbrook Ct, San Marcos, CA 92078.